Star Warz was created over 13 years ago and it quickly blew up to one of the finest Drum ‘n’ Bass concepts the world has ever seen. The success lies in a combination of high quality line ups, great artwork, a top class venue and a heavyweight sound-system. Star Warz has been visited by almost all upcoming or established artists & labels in the scene and it is one of the partners of Tomorrowland since day one. Last year Star Warz counted many mind-blowing parties as the Metalheadz night, 15 Years Virus Recordings & Soul:ution, the Tomorrowland stage, 10 Years of Exit Records and the last edition of 2013 with no one less than Andy C. Each of them memorable nights that will go down in the history books. 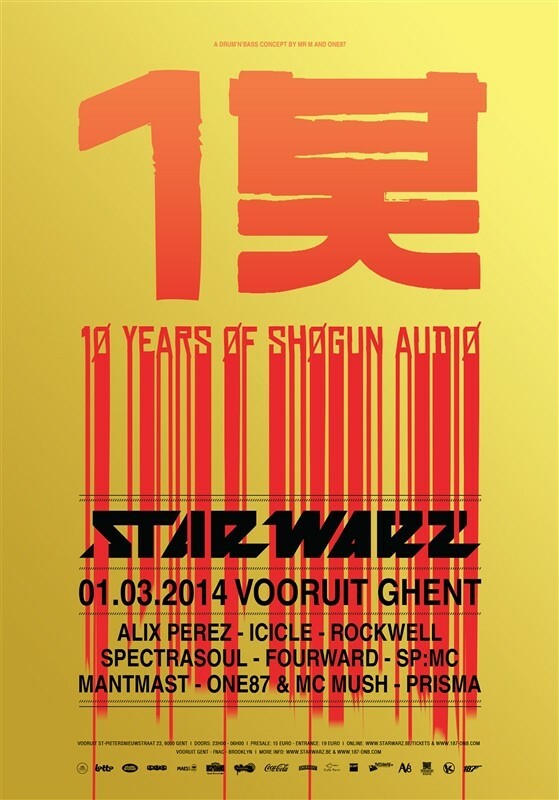 And Star Warz also starts 2014 off with a bang: for the first party in 2014, they present to you the 10th anniversary of one of the mightiest Drum’n’ Bass labels around: Shogun Audio! Since its inception in 2004 Shogun Audio has gone on to become one of the most essential labels in dance music today. Driven by its founders Friction and K-Tee the Shogun brand has developed into an all-encompassing Drum ‘n’ Bass juggernaut releasing some of the most breath-taking beats across the full spectrum and beyond. The ethos – if it’s good music, let’s get it out there! The elite league of exclusively signed Shogun artists adheres to the highest of standards, producing the very best in hi-grade Drum ‘n’ Bass, dubstep and bass music; Alix Perez, Rockwell, Icicle, Spectrasoul, The Prototypes and of course Friction & K-Tee all bring their own distinct sound ensuring the Shogun brand is ever-evolving and adapting. Behind a high-rolling label are high-rolling events. The Shogun Audio sessions at London’s Cable club and Brighton’s Digital have become synonymous with the best nights out in the country and across Europe. So with now over 40 Shogun events every year all over the UK and as far afield as Australia, Russia, Hungary, Croatia and Austria it’s true to say the brand is well and truly worldwide. With their continued Shogun podcasts, their own shows on Ministry of Sound radio, Rinse FM and now also BBC Radio 1’s Drum & Bass Show, there seems to be no stopping Shogun Audio. They are entering the year of their first decade and long may it continue! So here they are celebrating their 10th anniversary @ Star Warz, starting with Alix Perez who delivered two amazing albums on the label. The first one ‘1984’ from 2009 was widely regarded as one of the most influential releases of that year and was followed last year by ‘Chroma Chords’. Next up is Icicle who released his famous ‘Under the Ice’ album on Shogun Audio. It was ‘album of the month’ in leading dance magazine Mixmag. And also Rockwell was proclaimed one of the ‘Players of the Year’ by Mixmag magazine. His fresh, forward-thinking approach is one that sits perfectly alongside the rest of the Shogun elite. Latest singing to the Shogun crew is Fourward who kicked off this new chapter with the jaw dropping ‘Black Tooth Grin’ single on Shogun’s sister imprint SGN:LTD, plus their outing ‘On A Knife Edge’ on the ‘Way Of The Warrior 2’ label compilation. The Shogun dj’s will be fully supported by their steady MC’s SP:MC and MC Mantmast and Star Warz resident One87 who teams up with MC Mush. Young talent Prisma completes the line-up of this extravagant Shogun Audio B-day party!